It’s a pricey round, or at least it wouldn’t be accused of being inexpensive, but that’s where the criticism stops. This is among the finest loads you can put in your .308 rifle dedicated to hunting game. It is a heavy load for the .308 Winchester that favors animals in the large deer to elk to moose realm. 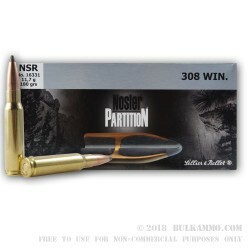 The projectile is special - the Nosler partition 30 caliber bullet that features a two part lead core surrounded by a multi-layer density copper jacket that helps to control expansion, penetration, weight retention and mushrooming/deformation. It is this spectacular bullet; loaded with some of the best premium components on the planet through the Sellier & Bellot factory ecosystem. This company has been producing ammunition longer than Winchester has been in existence. For some frame of reference, the S&B company started doing ammunition production over 190 years ago. They produce the better part of a billion rounds years at the Czech based production facilities. All of their ammunition is top tier production. 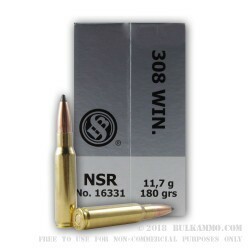 This 180 grain round is potent and pushes the .308 Winchester to the next level for those who need the strongest they can get with the best performance possible. Q: What are the ballistics of this round? A: Advice against using soft point ammunition in semi-automatic weapons is sometimes sound. The issue is not that the tip of the bullet will contact the gas port, but that the projectile might stop or hang up on the feed ramps as the weapon attempts to feed it into the chamber. 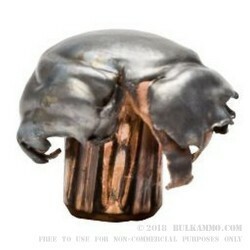 Unfortunately, the only way to determine if your particular rifle will cycle soft-point ammunition is to try it out. Make sure that you use the same magazines that you would use for hunting or other purposes when you test function.